Previously, our unofficial motto was “the UN-gym GYM”. The idea came straight from our members’ mouths. When people visit our locations, they understand that we’re different than the other local gyms. We’re also different from national chain gyms too. Why are we different? There are a few reasons. Our members enjoy our friendly and fun culture. Our staff are professional and care about helping you achieve your goals. 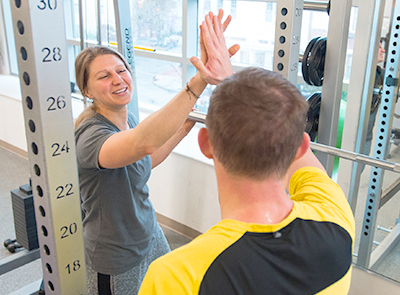 Whether you’re getting signed in, chatting after a class, or looking for someone to spot while you lift, we’re eager to engage with you! Our members also enjoy our other members. Strangers become friends and work out buddies. We like to foster inclusion, not exclusion. While we know people enjoy our staff and getting to know other members, many people join because they appreciate how clean our facilities are and (during the day) how the main rooms are bathed in sunlight. No dark, stinky, rubber rooms here! Our equipment is well-maintained and our space is open and airy. We believe that our amenities make going to the gym more enjoyable. Who doesn’t like fresh towels and complimentary coffee!? DC is a very busy city with people always coming and going. We understand the culture here and offer flexible membership options. We want you to want to come here, not feel like you’re signing away your freedom by being locked into a never-can-cancel-or-get-a-refund-cuz’-you-didn’t-read-the-fine-print contract. We talk about more class with less drama. Our instructors are committed professionals who offer studio-calibre classes. Our trainers are top notch. They’d never brag, but they’re truly talented and dedicated to their disciplines. Their level of passion helps motivate and inspire others to reach their potential. Whether you’re ready to refresh your gym routine or get more class with less drama, MINT can reset your expectations. Come try MINT for FREE for FIVE days. The only way to know if MINT is right for you is to come see for yourself. We look forward to meeting you!